I said it earlier this week, my day planner is the most important book in my life, my bible. It contains everything I need to function day after day, on all fronts and I have a very specific system to keep it and myself organised. Welcome to my planner! This, is how every single page look like. And, yes, it looks a lot like a "Bullet Journal"
Except it isn't really one, mostly because the true Bullet Journaling system would really not work for me. I am way way way too much of an advance planner for the traditional Bullet journaling system which ask you to only really fill you planner with one month at a time. I already have Blog stuff planned for next December people, and months of school events and holidays to log. But the Bullet system has it's pro, especially for people who like making lists. And I am one of these people too. 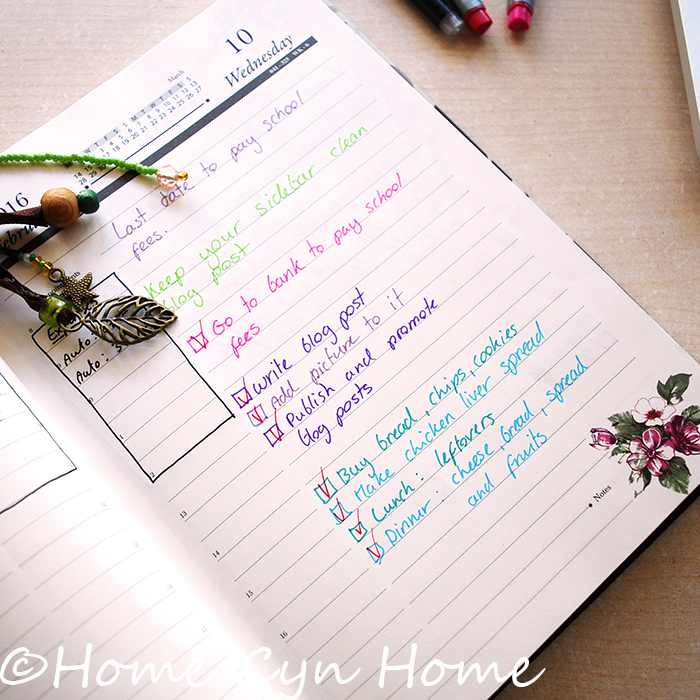 I love lists, I love ticking off finished tasks (it gives me a certain sense of gratification, list makers will understand). But instead of pretty much hand writing an entire year planner in an empty notebook, I decided to spare myself the hassle and use a planner that has already been printed and put my little "Bullet lists" in it. I love colours, and I really function better using a colour coding system for my tasks. I use a combination of Staedtler and Maped fineliners. I am lucky to be able to buy them individually in just the colours I like from my local stationery shop. All the tasks, appointment and planned events are written on the top of the page, without bullets. They go in days, weeks, or even months in advance. The colour I use for these isn't set EXCEPT for blog posts. For them I always the light green pen. If I happen to have been able to write the blog post in advance and have scheduled it on Blogger, I will add the time at which it will go live in dark green underneath. Then comes the lists section. For these I use different colours so that I know what is what and I use two shades for each section, it's easier on the eye that way. The purple section is everything related to the blog and my creative process. I write down what I have to do each day, even if it is something routine like taking time to promote my content. Writing it down makes me accountable and the temptation to skip the task "just for one day" is removed. This section is also the one I will use to list a craft or DIY project I want to make that day. Again because marking it on the planner makes me accountable, and less likely to just skip it. The teal/light blue section is for all the things related to household and family. I end up using this section for my meal planning, and chores. And while breakfast and lunch are meals I usually have alone, I still make a point of writing down what's on the menu. That way on a chaotic day I don't have to think about it, and yes it has reminded me to just "eat something already" on particularly hectic days. My non urgent or essential shopping list (aka the stuff I won't be in a pickle if I didn't get the time) make it to that section as well. The pink section is everything urgent or super important that absolutely must be done today. Things that require my utmost priority. Urgent shopping usually goes in that category, and it is usually because I really lack a specific ingredient to cook dinner. Every completed task gets ticked off the list with my red pen, if by the end of the day that task hasn't been completed, I strike it off and carry it over to the next day if it still need to be done. I spend every evenings writing my lists for the next day, with possibly a few tasks spilling to the next to next day or further. Then, I refer to my planner all through the day. I also have a "black box" section in which I log all my cash expenses. DH like to keep our finance log in a fancy software and I am a bit more old school about that. Since he is manning that task and doesn't do it daily, I keep track of the cash expense for him to fish out of the planner. Do you keep a day planner? How do you organise it? Share your system in the comments below, I'd love to read all about it. This post is just so SWISS! You are truly a model of "schweizer Grundlichkeit." Or should that be "schweize Grundlichkeit?" Anyway, I haven't had my morning chai yet so I can't even be arsed to put a proper umlaut over the u in Grundlichkeit. I don't think the Germans would capitalize Schweizer as it's an adjective in this case but the Dutch would, I think the Germans would leave the r off of schweize too. My German grammar is still horrid. Yep that is definitely a show of Swiss efficiency LOL, when you come to an over regulated, over organised country certain things are bound to stick forever :-) I spent my whole childhood and school years having to write things in my school diary, and then regular grown up diary that kicking the habit is near impossible, they groom us to be organised from Kindergarten. It would be schweizer Grundlichkeit indeed, no capital S on schweizer as it is an adjective, and yep umlauts on the u if the keyboard allows it, though you can also write it Gruendlichkeit instead, and everybody will know how to pronounce the "u". Funny how it's "schweizer Gruendlichkeit" but "deutsche Gruendlichkeit" & not "deutscher." But it would also be "amerikanner Gruendlichkeit." Between hearing Plattdietsch in my mom's family, Cajun Patois French in my dad's family, Spanish from 40% of the Californians I grew up with, and American English from the other 60% of Californians I grew up with, I can't keep any of it straight. Now I hear Kashmiri, Hindi, Urdu, & Nepali all day & I'm lost too. happy saraswati pooja to you and family. may the goddess of knowledge bless u with greater creativity.